Diondray McKoy, 21, is a convict tonight after he was found guilty of trying to kill Everald Gray, 29, in June of 2009. During the trial which started on October 30, Gray took the stand and testified that he was at home at 8:30 on the night of June 23, 2009, when he heard someone calling his name. He went to the door and that was when he saw a man wearing a black shirt and a pair of blue pants, who then pulled out a gun that had been wedged under the waist of his pants. Gray said that just as he attempted to turn around and run, he felt a burning sensation and realized he had been shot. Gray told the court that he ran into his room and collapsed, losing consciousness. But Gray appeared to be confused during his testimony and had to be given his statement on several different occasions, to refresh his memory. At one point, he even told the court that he didn’t wish to pursue the matter any further, but Justice John “Troadio” Gonzalez explained to him that it was no longer in his hands, but in the hands of the State of Belize, which was represented by attorneys Sheneiza Smith and Javier Chan. In his statement, it was revealed that Gray told the police that he had seen the face of the person who had shot him that night, but in his testimony, he told the court that he couldn’t see the face of his shooter because the lamppost by his house had been going on and off, and also because the shooter was wearing a fitted cap which was pulled all the way down to his eyes. His testimony was a continuous seesaw between “yes [he] saw the face” and “no [he] didn’t see the face,” and between assertions that he “didn’t quite remember” because it was so long ago and declarations that everything in his statement was true. It went on like this until Smith asked the court’s permission to treat Gray as a hostile witness. The Crown closed its case after calling five more witnesses, and then it was McKoy’s turn to take the stand. McKoy testified that he did not do the shooting and was nowhere near the Queen Charlotte Street area where Gray was living during the time of the shooting because he was at his mother’s house from 3:00 that evening. After leaving his mother’s house at 9:00 that night, he went straight to his house, so he couldn’t have been the person whom Gray saw, McKoy said. McKoy then called his mother as his witness, who corroborated everything he had said. The jury went into deliberation and came out two and half hours later with an eight to one split decision of guilty. McKoy hung his head very low after hearing the news, and seemed distraught, almost to the point of tears. He was given one week in which to prepare his mitigation plea and present witnesses to the court to speak on his behalf. His sentencing will take place on Friday, November 15, 2013. 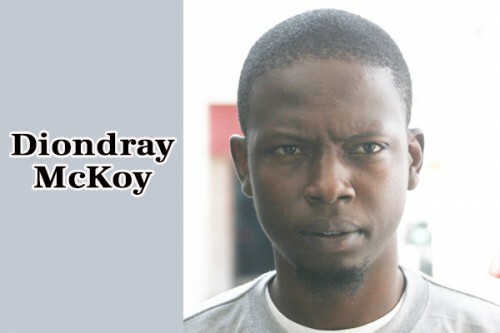 It is noteworthy that McKoy is currently on remand for the attempted murder of Everald Cardinez.